HAVANA, Cuba -- Cuban Head of State Raul Castro met with Leonid Kuchma, former President of Ukraine and special envoy of that country's current President Victor Yanukovich, the national media reported on Friday. 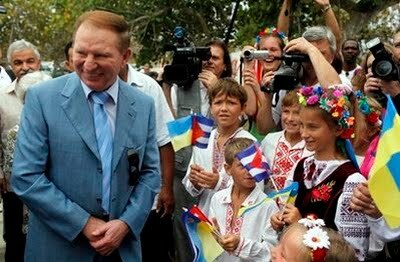 Former Ukraine's President Leonid Kuchma is welcomed by children during the celebrations of the 20th anniversary of the Tarara Health Programe in Tarara, Cuba, Monday, March 29, 2010. The Tarara health care center was specially created in 1990 to treat the victims of the 1986 Chernobyl nuclear tragedy, in the former Soviet Union. Kuchma participated in the celebration on the occasion of the 20th anniversary of the Cuban health care program for children affected by the nuclear catastrophe at the Chernobyl power plant in 1986. According to newspapers, and television and radio news programs, the cordial exchange analyzed the positive state and prospects of bilateral relations, as well as current challenges both countries and humankind should face, particularly the situation unleashed in Haiti after the January 12 earthquake. Adverse effects on the environment, caused by climate change, and the imperative to face up to serious problems with responsibility were also debated by the two officials. Kuchma handed over the Order of Merit in its first degree, granted to Cuban Revolution leader Fidel Castro, and the "Prince Yaroslav the Wise" Order, also in the first degree, to President Raul Castro. Both decorations were granted by the Ukraine president for the aid given to the victims of the Chernobyl accident. The Cuban president expressed gratitude for the high recognition on his and Fidel Castro's behalf.